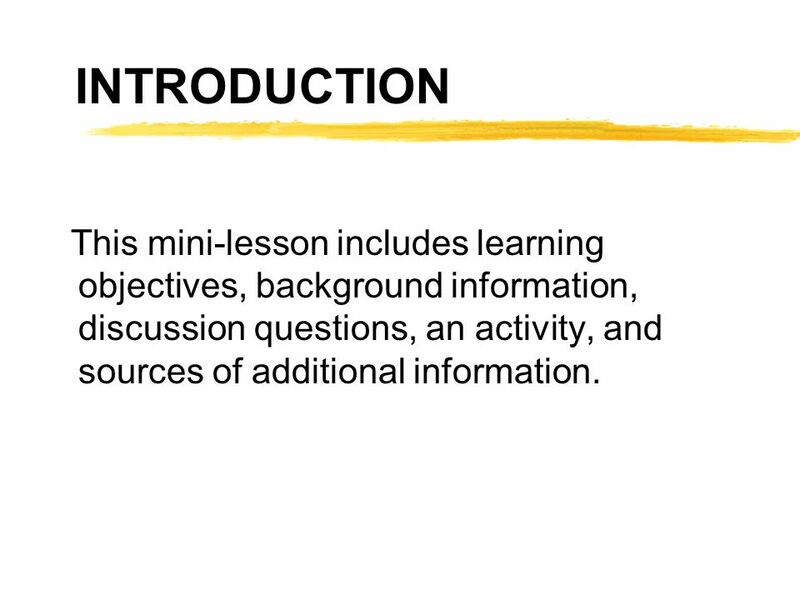 INDIANA DEPARTMENT OF FINANCIAL INSTITUTIONS CONSUMER EDUCATION Copyright, 1996 © Dale Carnegie & Associates, Inc.
2 INTRODUCTION This mini-lesson includes learning objectives, background information, discussion questions, an activity, and sources of additional information. 4 Charge It! Do you understand what credit is and how to use it wisely? 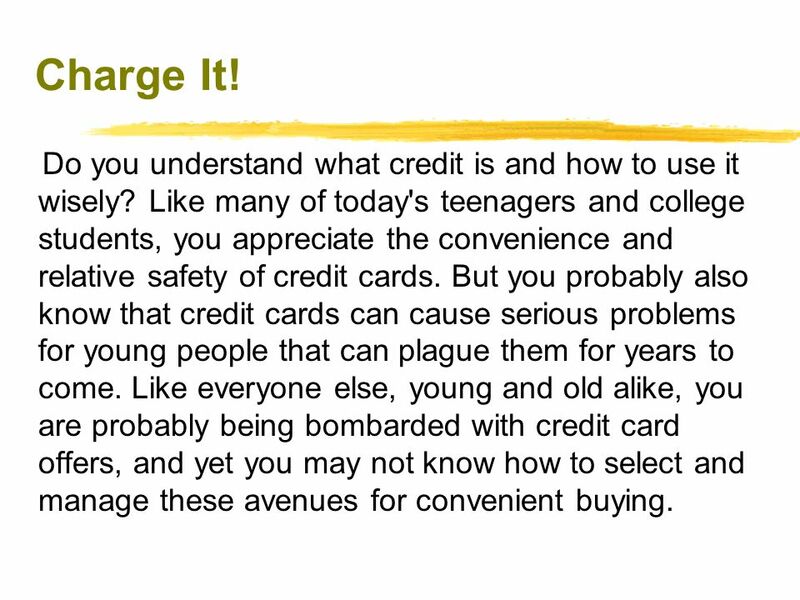 Like many of today's teenagers and college students, you appreciate the convenience and relative safety of credit cards. But you probably also know that credit cards can cause serious problems for young people that can plague them for years to come. Like everyone else, young and old alike, you are probably being bombarded with credit card offers, and yet you may not know how to select and manage these avenues for convenient buying. 5 Charge It! You may not realize what problems you can create for yourself when you choose to use "plastic." 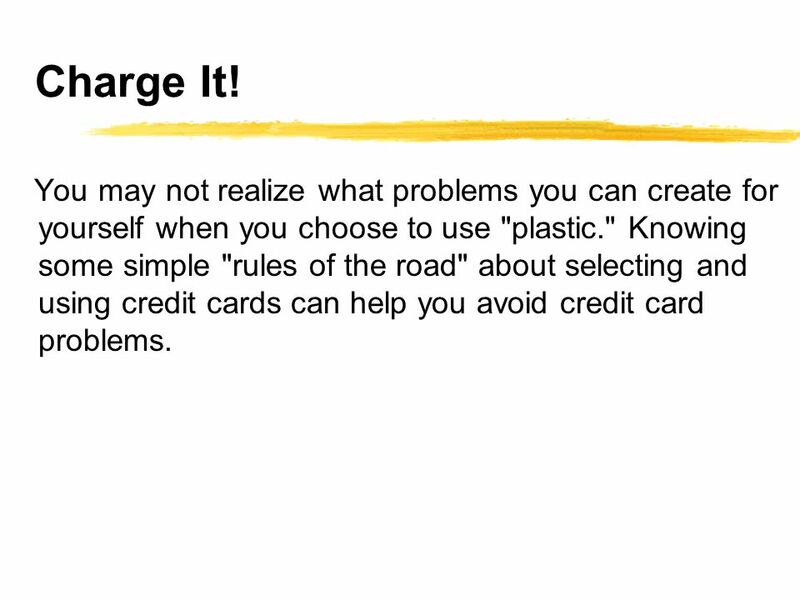 Knowing some simple "rules of the road" about selecting and using credit cards can help you avoid credit card problems. 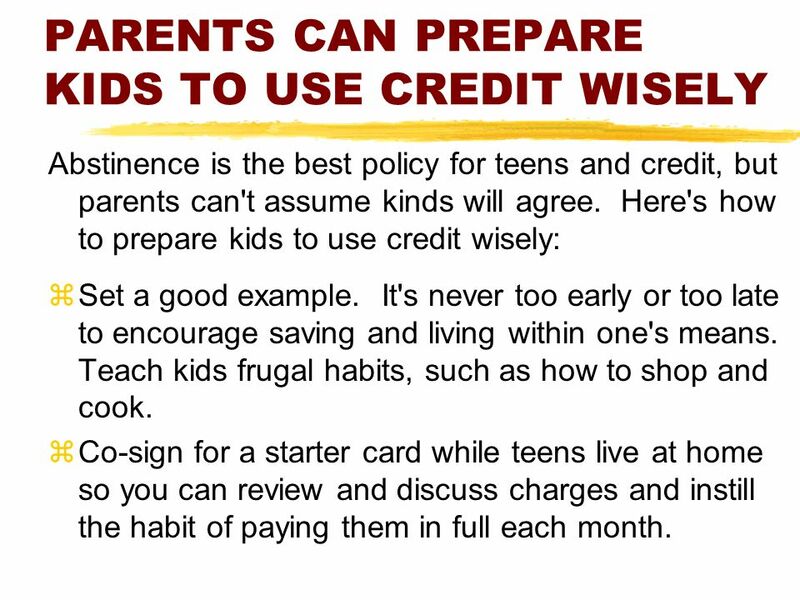 Abstinence is the best policy for teens and credit, but parents can't assume kinds will agree. 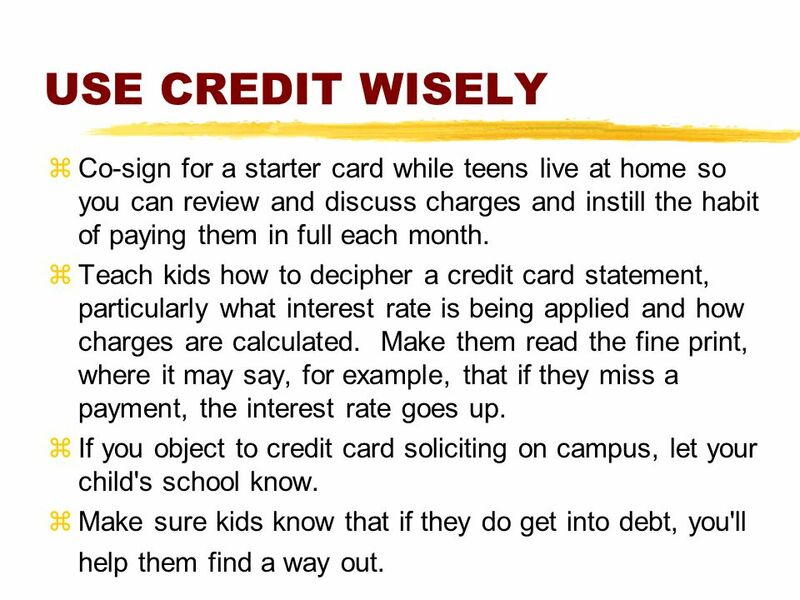 Here's how to prepare kids to use credit wisely: Set a good example. It's never too early or too late to encourage saving and living within one's means. Teach kids frugal habits, such as how to shop and cook. Co-sign for a starter card while teens live at home so you can review and discuss charges and instill the habit of paying them in full each month. 7 USE CREDIT WISELY Co-sign for a starter card while teens live at home so you can review and discuss charges and instill the habit of paying them in full each month. Teach kids how to decipher a credit card statement, particularly what interest rate is being applied and how charges are calculated. Make them read the fine print, where it may say, for example, that if they miss a payment, the interest rate goes up. If you object to credit card soliciting on campus, let your child's school know. Make sure kids know that if they do get into debt, you'll help them find a way out. 8 Advantages Credit is a contract based on your promise to pay in the future for goods and services you receive today. The advantages of credit cards are significant, and "plastic" can be an important resource in your money management plan. Credit cards offer protection against theft of your cash. You can purchase the products and services you need when you need them, even if you do not have the cash in your pocket. 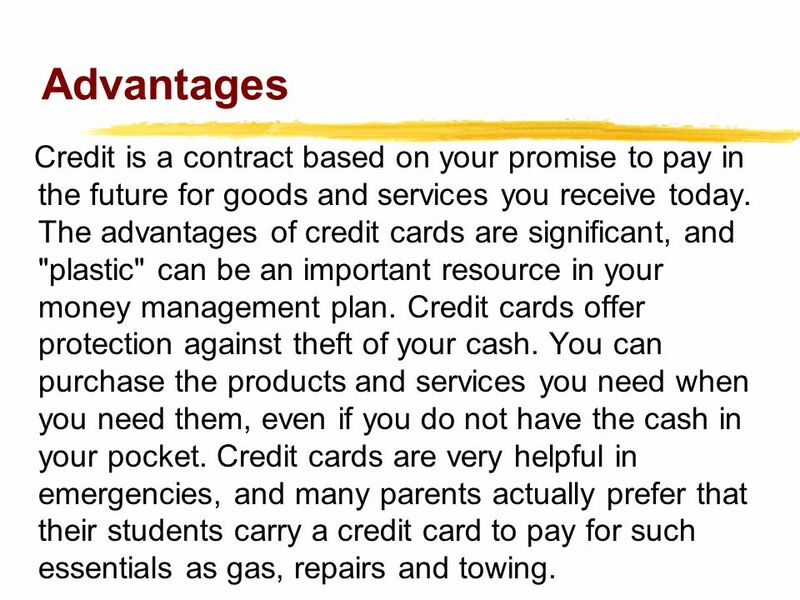 Credit cards are very helpful in emergencies, and many parents actually prefer that their students carry a credit card to pay for such essentials as gas, repairs and towing. 9 Advantages They feel more comfortable knowing that their young adults have the ability to take care of any emergency quickly with a credit card. 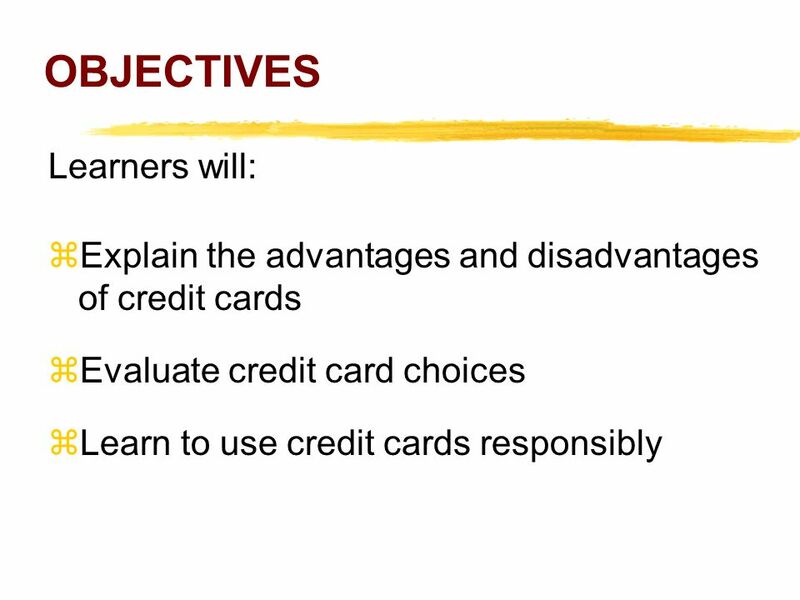 Also, you can become a better money manager as you learn to use credit responsibly. 10 Disadvantages There are disadvantages, however, to using credit. When you carry a credit card, it is easy to buy beyond your means, to spend so much that you cannot meet the bill when it is due. When you carry a credit card, it is very easy to buy on impulse and forget you are spending future income, money that you do not yet have (and may not have in time). Moreover, if you only pay the minimum balance each month, you may be surprised to find out how many years it will take to take to pay off the balance. 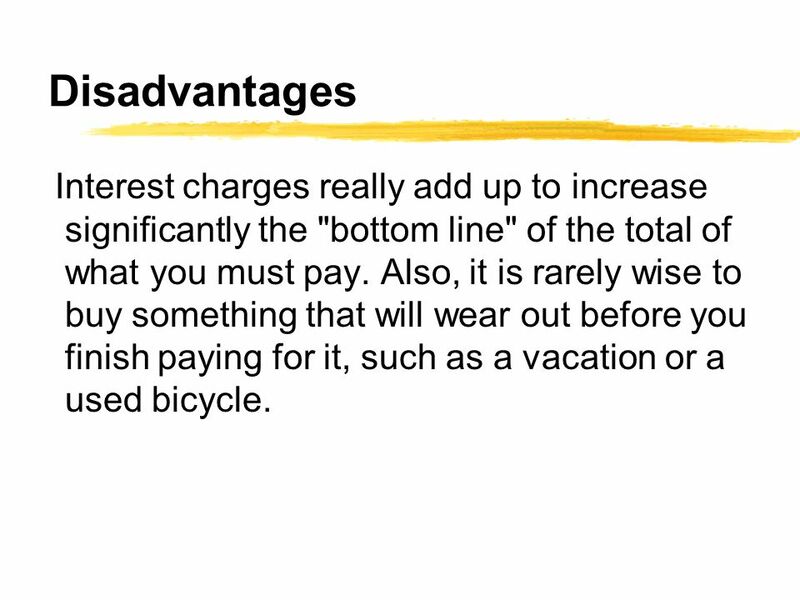 11 Disadvantages Interest charges really add up to increase significantly the "bottom line" of the total of what you must pay. Also, it is rarely wise to buy something that will wear out before you finish paying for it, such as a vacation or a used bicycle. 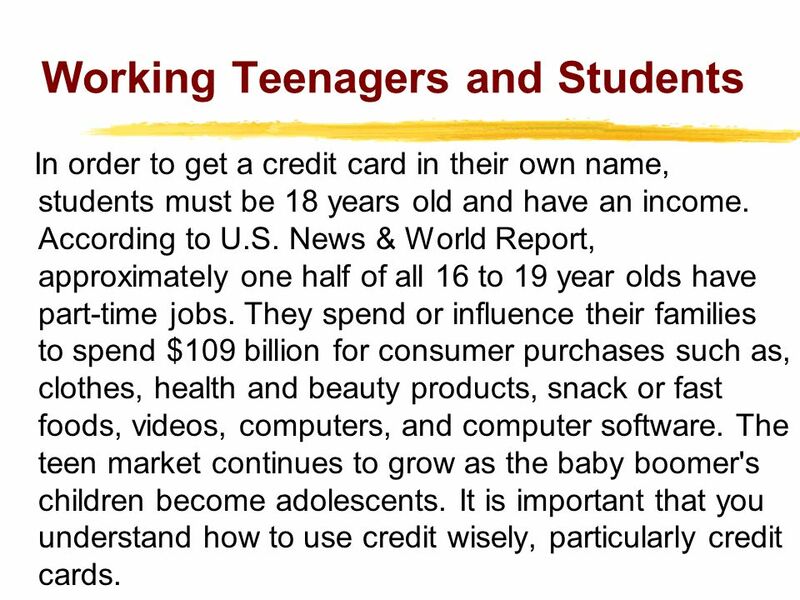 In order to get a credit card in their own name, students must be 18 years old and have an income. According to U.S. News & World Report, approximately one half of all 16 to 19 year olds have part-time jobs. They spend or influence their families to spend $109 billion for consumer purchases such as, clothes, health and beauty products, snack or fast foods, videos, computers, and computer software. The teen market continues to grow as the baby boomer's children become adolescents. It is important that you understand how to use credit wisely, particularly credit cards. 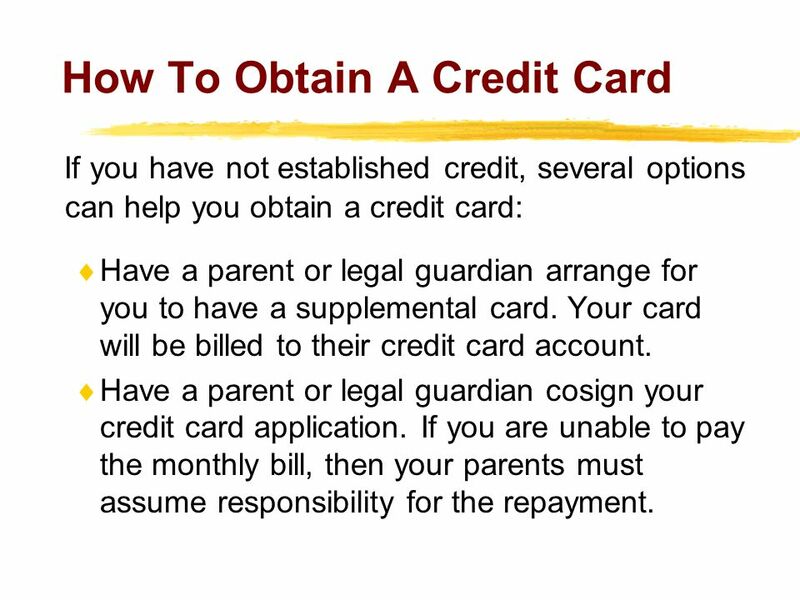 If you have not established credit, several options can help you obtain a credit card: Have a parent or legal guardian arrange for you to have a supplemental card. Your card will be billed to their credit card account. Have a parent or legal guardian cosign your credit card application. If you are unable to pay the monthly bill, then your parents must assume responsibility for the repayment. Open a saving and/or checking account at a bank or credit union and agree to maintain one month's credit limit in a savings account. Then if you do not pay your monthly payment, the bank will remove the money from your account. 15 Secured Credit Two basic types of credit are secured and unsecured. 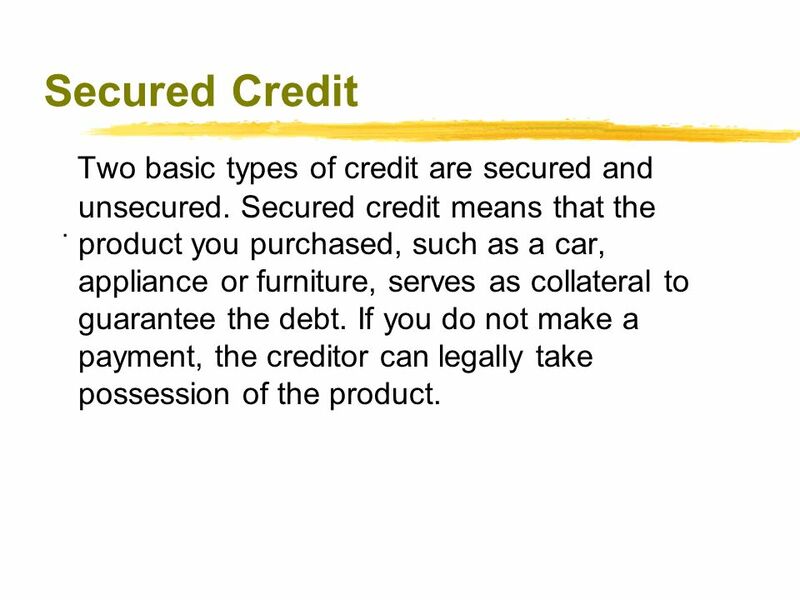 Secured credit means that the product you purchased, such as a car, appliance or furniture, serves as collateral to guarantee the debt. If you do not make a payment, the creditor can legally take possession of the product. .
16 Unsecured Credit Unsecured credit is based on your promise and signature to repay the debt without committing your savings or other collateral as a guarantee. Credit cards can be either secured or unsecured. Most credit cards are unsecured. 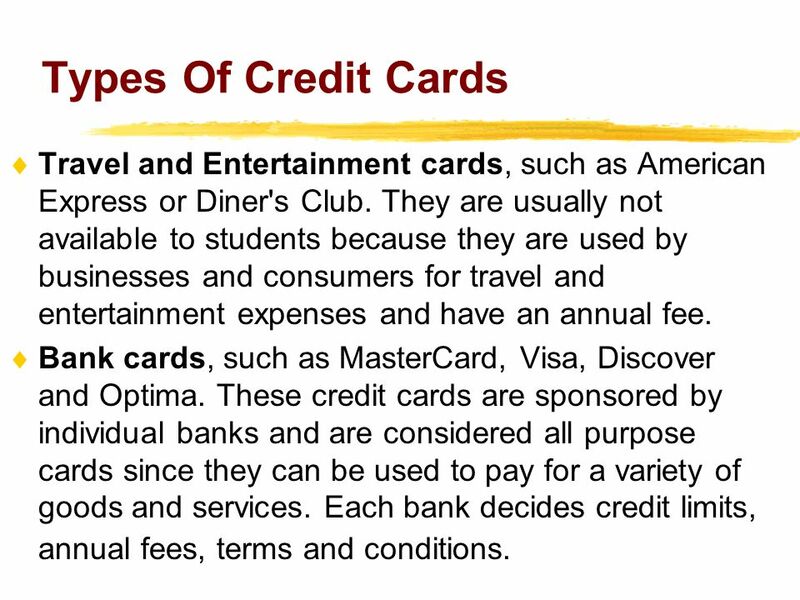 17 Types Of Credit Cards Travel and Entertainment cards, such as American Express or Diner's Club. They are usually not available to students because they are used by businesses and consumers for travel and entertainment expenses and have an annual fee. Bank cards, such as MasterCard, Visa, Discover and Optima. These credit cards are sponsored by individual banks and are considered all purpose cards since they can be used to pay for a variety of goods and services. Each bank decides credit limits, annual fees, terms and conditions. 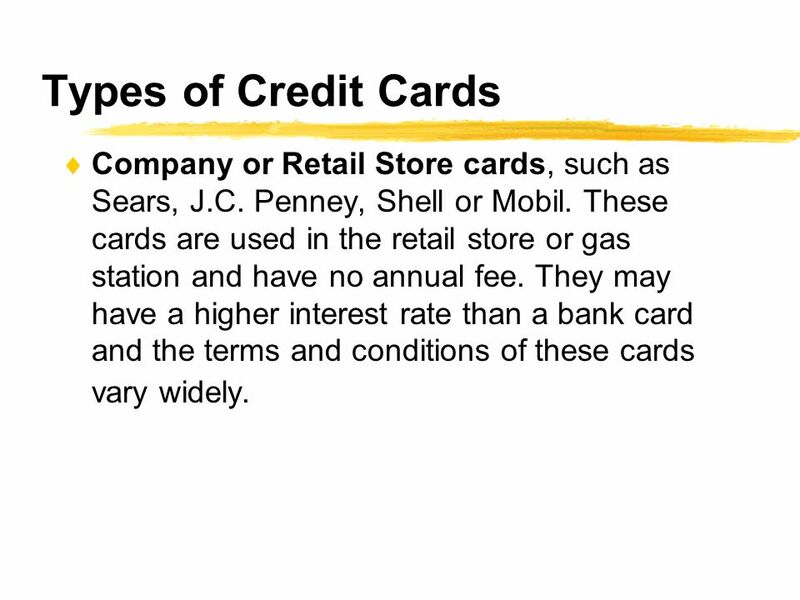 18 Types of Credit Cards Company or Retail Store cards, such as Sears, J.C. Penney, Shell or Mobil. These cards are used in the retail store or gas station and have no annual fee. They may have a higher interest rate than a bank card and the terms and conditions of these cards vary widely. 19 Credit Record The way you use credit will effect your credit history and a negative credit history is a serious liability. Your credit history is maintained by credit bureaus in the form of a credit report. 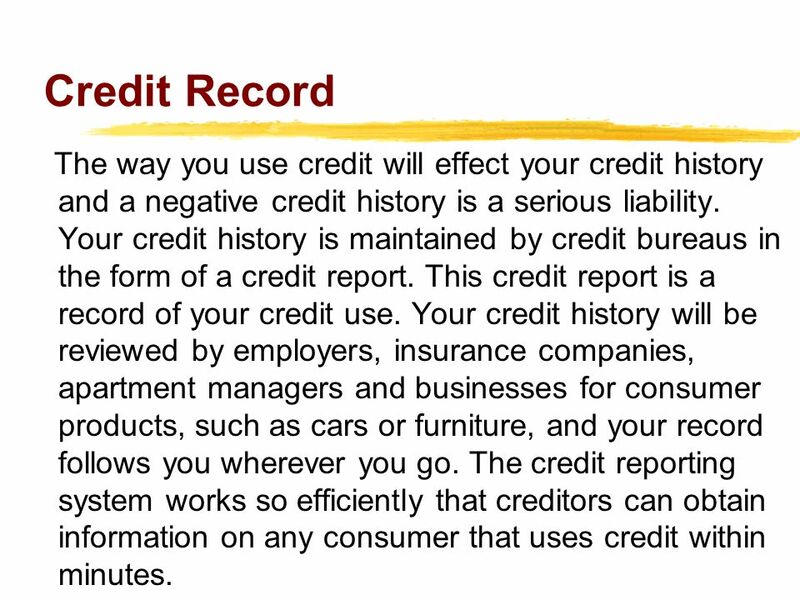 This credit report is a record of your credit use. Your credit history will be reviewed by employers, insurance companies, apartment managers and businesses for consumer products, such as cars or furniture, and your record follows you wherever you go. The credit reporting system works so efficiently that creditors can obtain information on any consumer that uses credit within minutes. 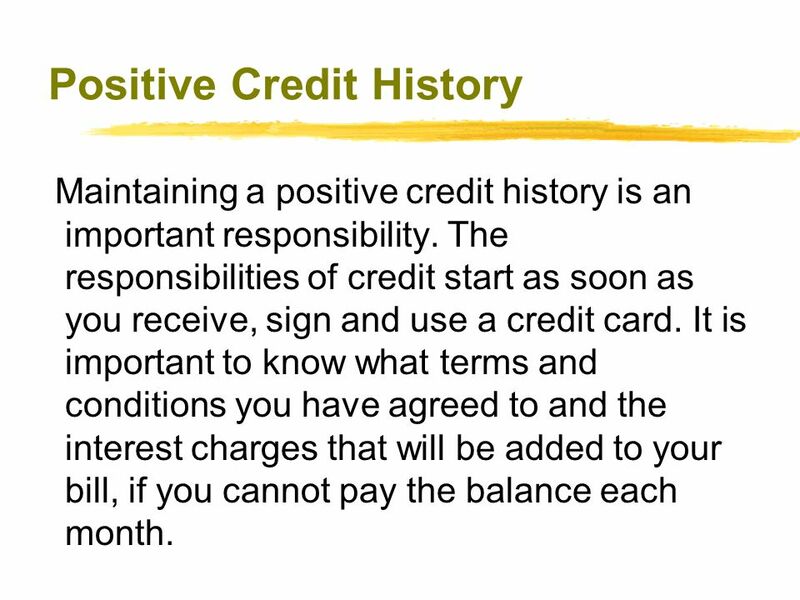 Maintaining a positive credit history is an important responsibility. 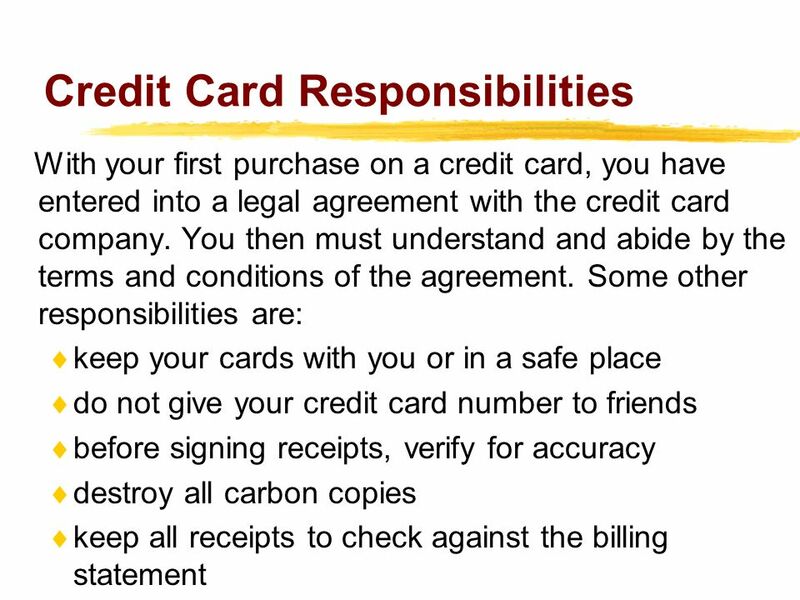 The responsibilities of credit start as soon as you receive, sign and use a credit card. It is important to know what terms and conditions you have agreed to and the interest charges that will be added to your bill, if you cannot pay the balance each month. 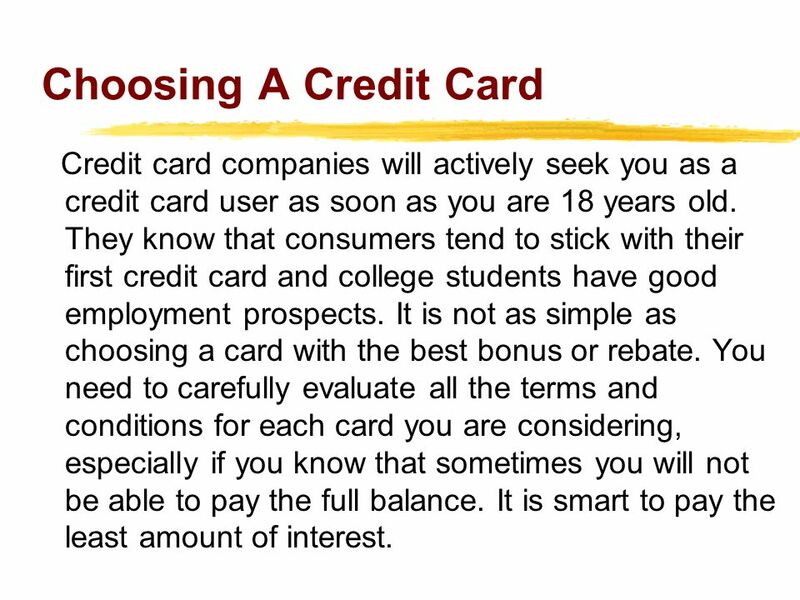 21 Choosing A Credit Card Credit card companies will actively seek you as a credit card user as soon as you are 18 years old. They know that consumers tend to stick with their first credit card and college students have good employment prospects. It is not as simple as choosing a card with the best bonus or rebate. You need to carefully evaluate all the terms and conditions for each card you are considering, especially if you know that sometimes you will not be able to pay the full balance. It is smart to pay the least amount of interest. 22 Choosing A Credit Card Before you select a credit card, it helps if you have a budget that identifies your income and expenses. 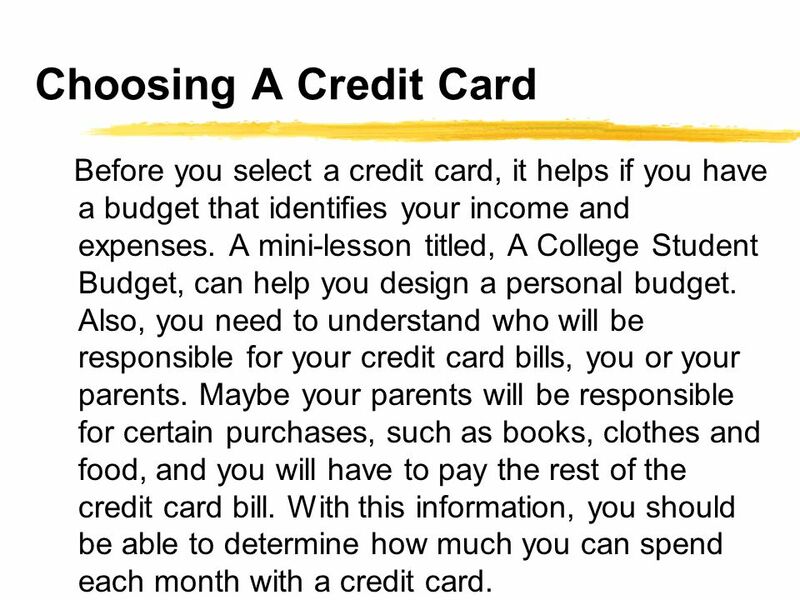 A mini-lesson titled, A College Student Budget, can help you design a personal budget. Also, you need to understand who will be responsible for your credit card bills, you or your parents. Maybe your parents will be responsible for certain purchases, such as books, clothes and food, and you will have to pay the rest of the credit card bill. 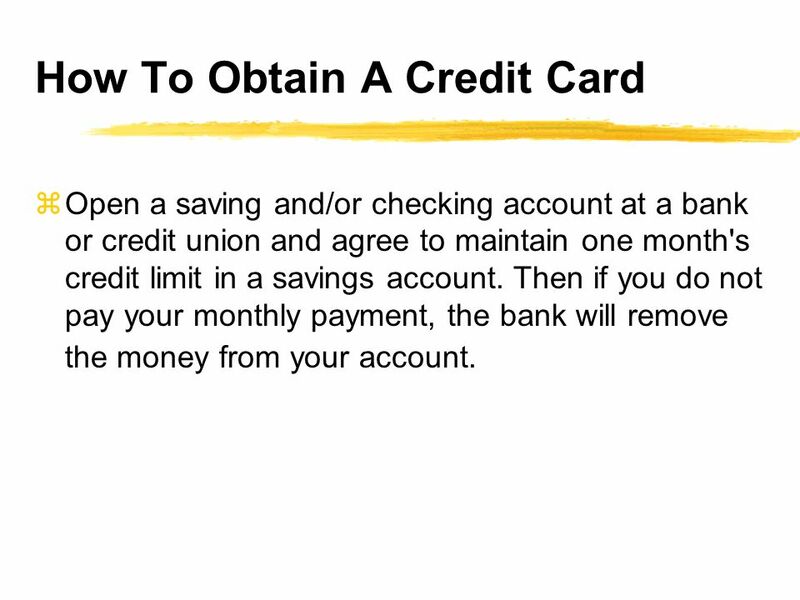 With this information, you should be able to determine how much you can spend each month with a credit card. 24 Costs of Credit Finance Charge — The dollar amount paid to use credit, includes interest and all charges associated with the transaction Grace Period — The grace period is the number of days you have before a credit card company starts charging interest on new purchases. 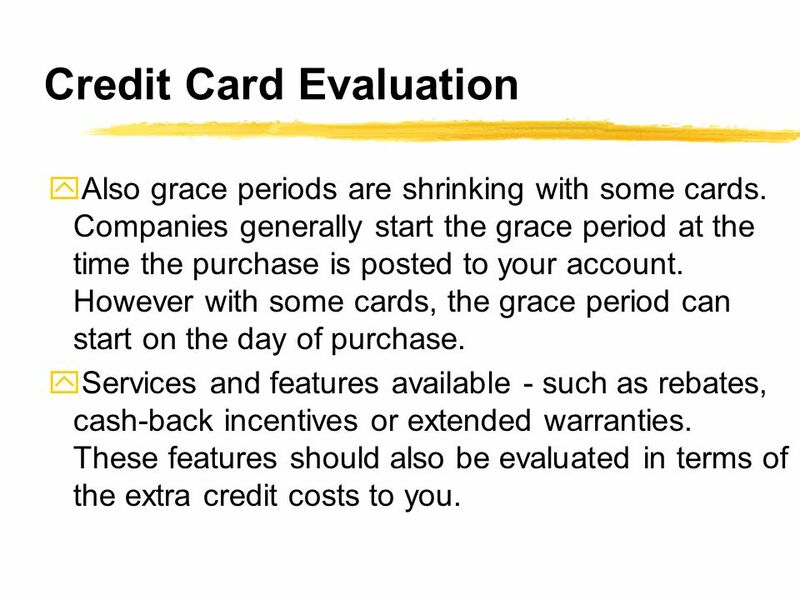 Not all credit cards have a grace period. Periodic Rate — The interest rate the card issuer applies to your outstanding account balance to figure the finance charge for each billing cycle. Because there can be a significant difference in the total amount of finance charges among various cards, it is important to know how the interest rate is calculated. The credit card company will use one of three methods: Average Daily Balance Method. This is the most commonly used method. You are given credit for your payment from the day the credit card issuer receives it and the interest in calculated on the basis of the average amount owed during the previous month. Adjusted Balance Method. This method is the most beneficial to the consumer and produces the lowest finance charges. The balance is calculated by subtracting the payments and any credits from the balance you owe at the end of the previous billing period. Previous Balance Method. This is the most expensive method. 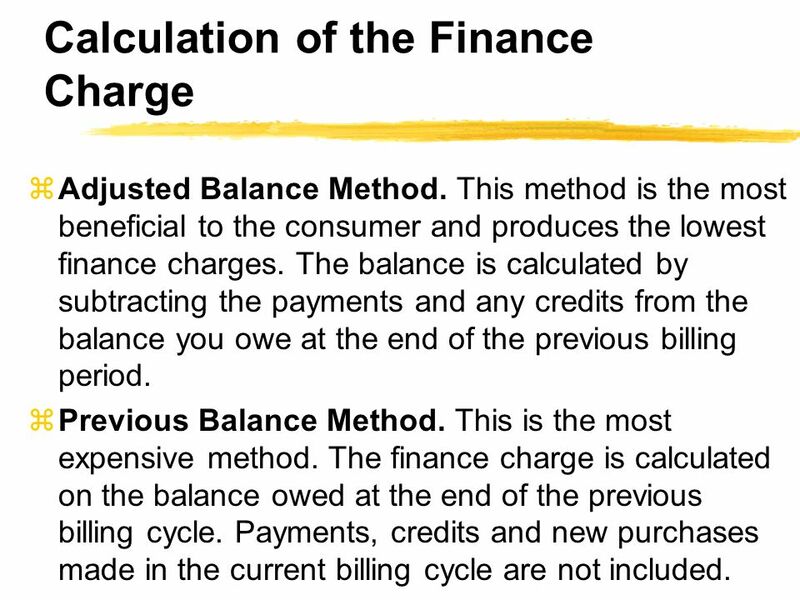 The finance charge is calculated on the balance owed at the end of the previous billing cycle. 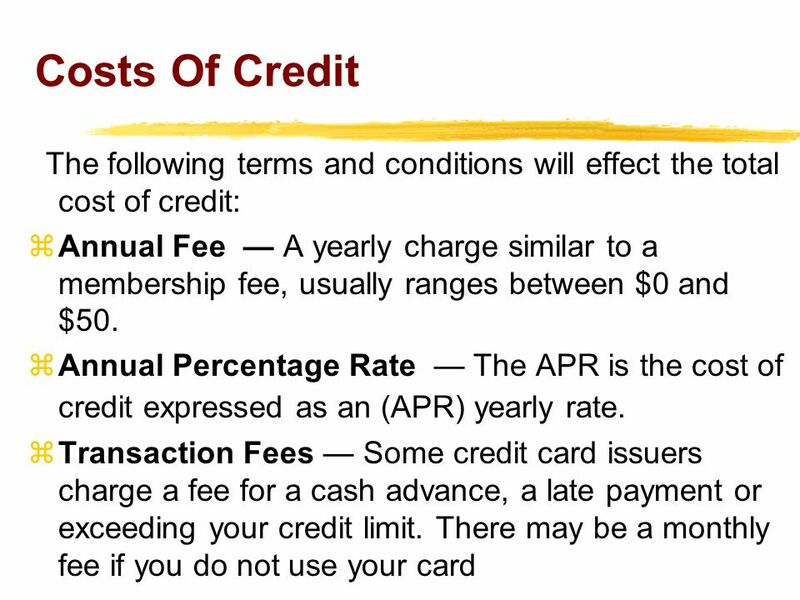 Payments, credits and new purchases made in the current billing cycle are not included. 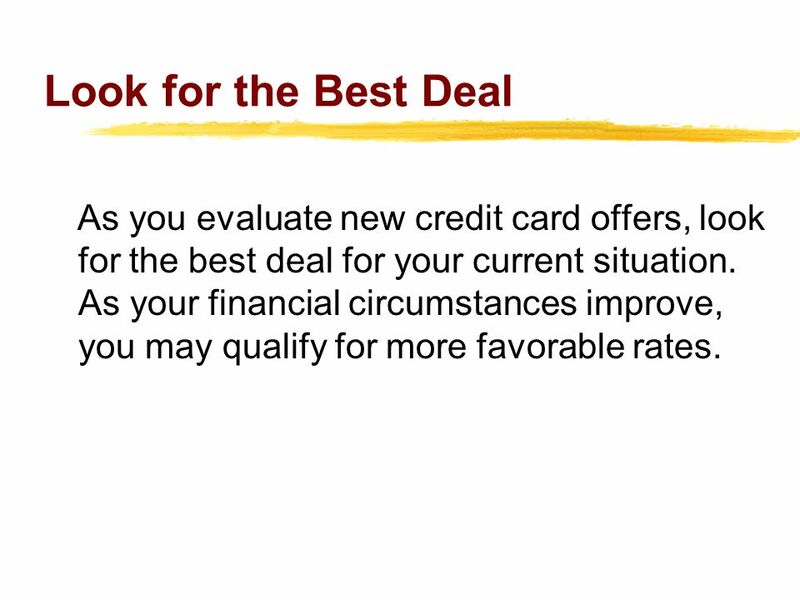 27 Look for the Best Deal As you evaluate new credit card offers, look for the best deal for your current situation. As your financial circumstances improve, you may qualify for more favorable rates. 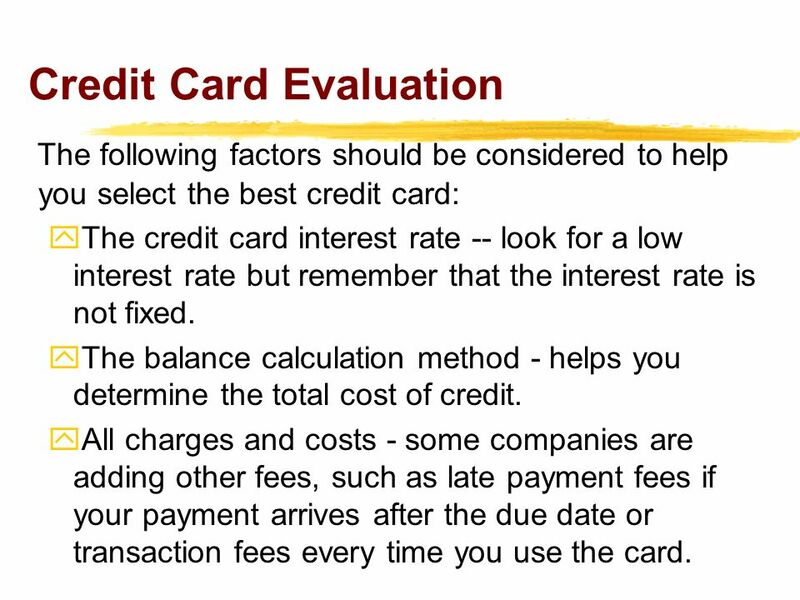 The following factors should be considered to help you select the best credit card: The credit card interest rate -- look for a low interest rate but remember that the interest rate is not fixed. 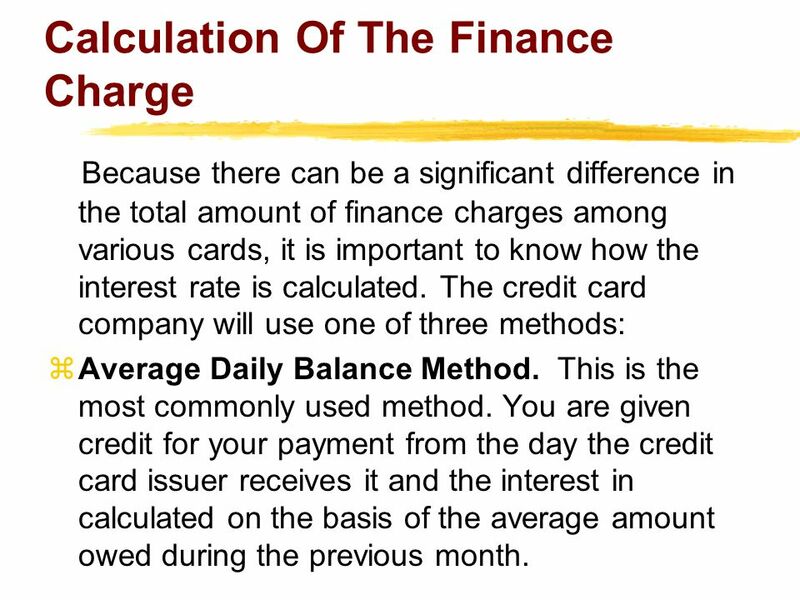 The balance calculation method - helps you determine the total cost of credit. All charges and costs - some companies are adding other fees, such as late payment fees if your payment arrives after the due date or transaction fees every time you use the card. Also grace periods are shrinking with some cards. Companies generally start the grace period at the time the purchase is posted to your account. However with some cards, the grace period can start on the day of purchase. Services and features available - such as rebates, cash-back incentives or extended warranties. These features should also be evaluated in terms of the extra credit costs to you. 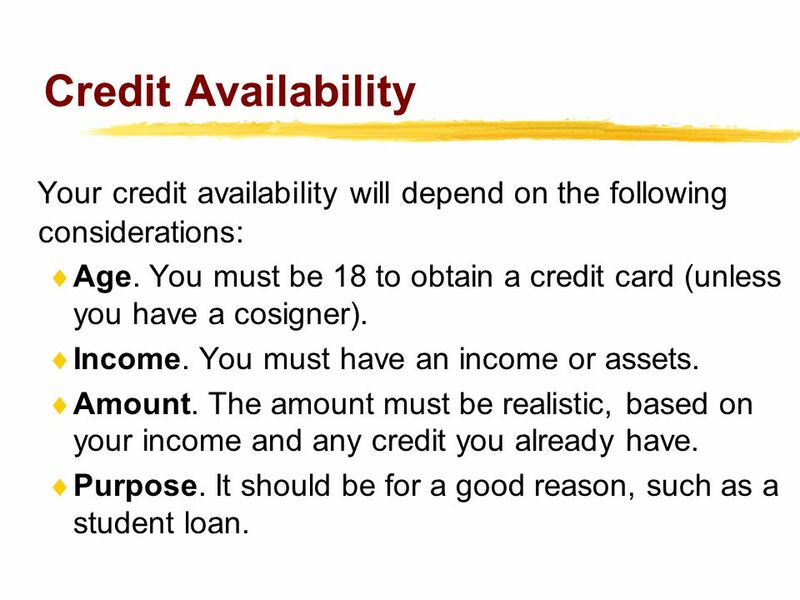 30 Credit Availability Your credit availability will depend on the following considerations: Age. You must be 18 to obtain a credit card (unless you have a cosigner). Income. You must have an income or assets. Amount. The amount must be realistic, based on your income and any credit you already have. Purpose. It should be for a good reason, such as a student loan. inform the credit card company immediately if you lose your credit card become familiar with the consumer credit laws that protect you. 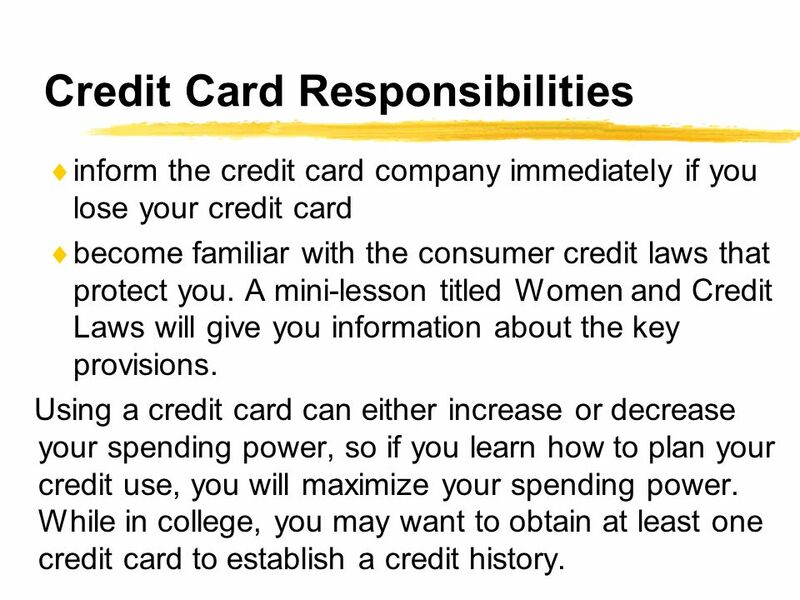 A mini-lesson titled Women and Credit Laws will give you information about the key provisions. Using a credit card can either increase or decrease your spending power, so if you learn how to plan your credit use, you will maximize your spending power. While in college, you may want to obtain at least one credit card to establish a credit history. 1. 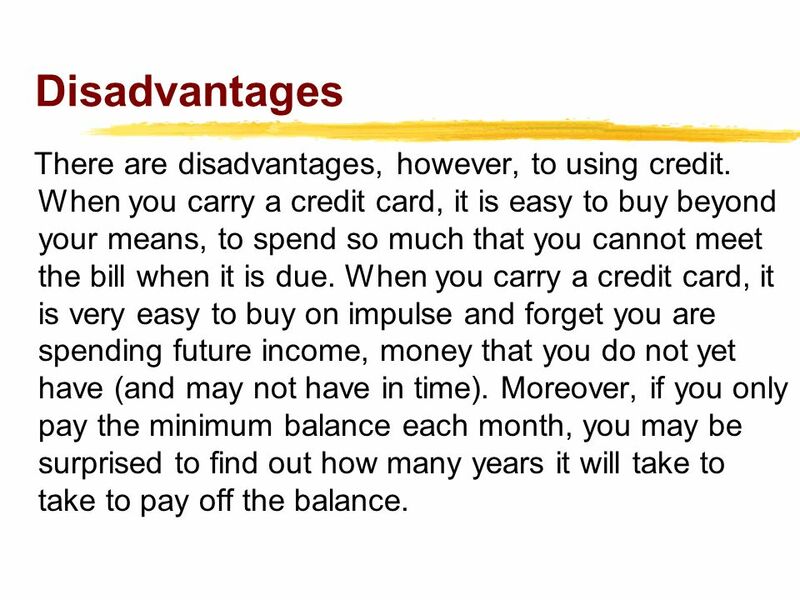 What are the advantages and disadvantages of credit? 2. What are the two types of credit and how are they used? 3. Why do think students should have a credit card? 4. What costs are involved with credit cards? 5. Why is it important to shop for credit? 6. 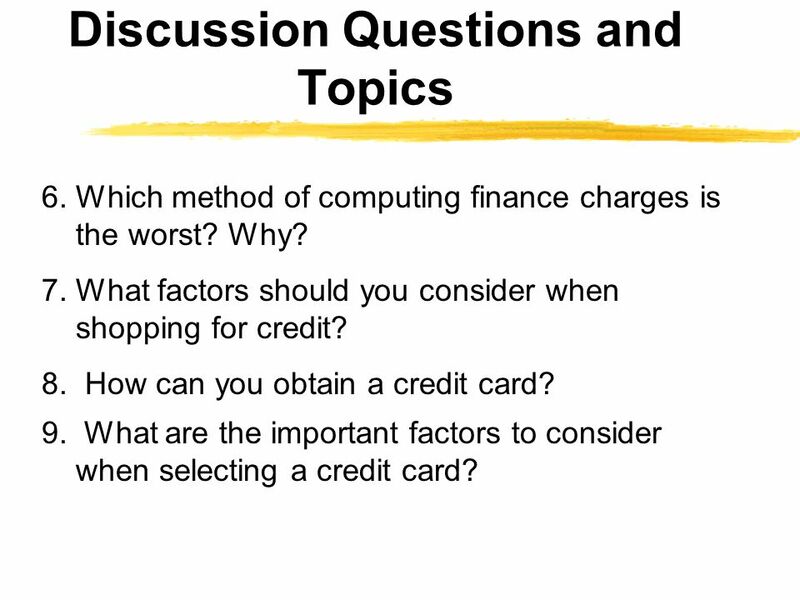 Which method of computing finance charges is the worst? Why? 7. What factors should you consider when shopping for credit? 8. How can you obtain a credit card? What are the important factors to consider when selecting a credit card? 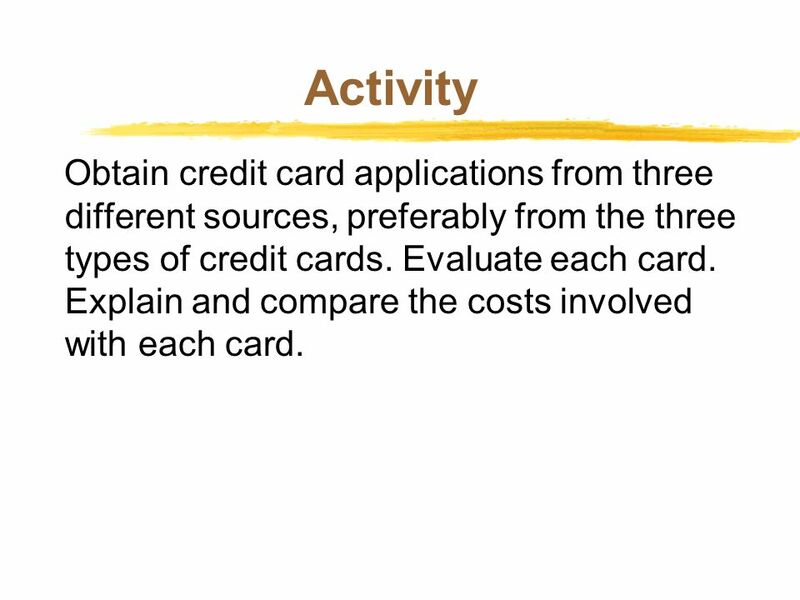 35 Activity Obtain credit card applications from three different sources, preferably from the three types of credit cards. Evaluate each card. Explain and compare the costs involved with each card. 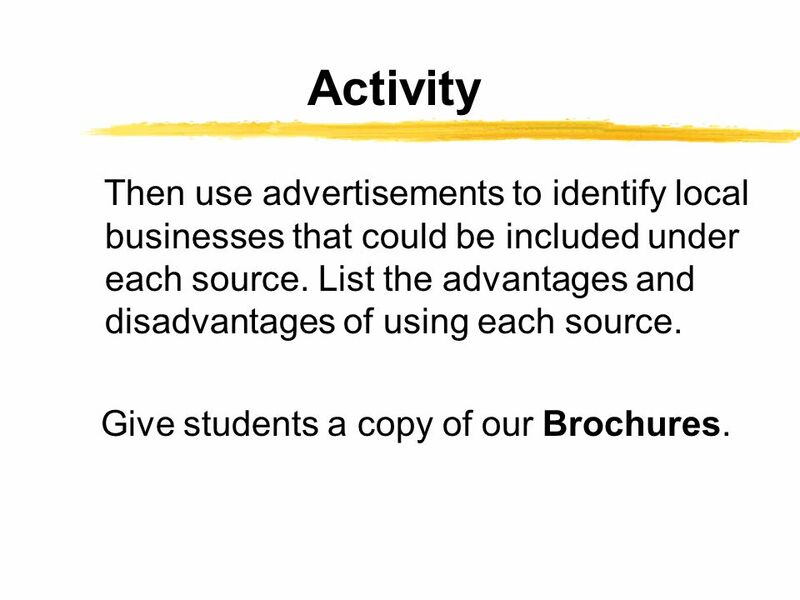 36 Activity Then use advertisements to identify local businesses that could be included under each source. List the advantages and disadvantages of using each source. Give students a copy of our Brochures. 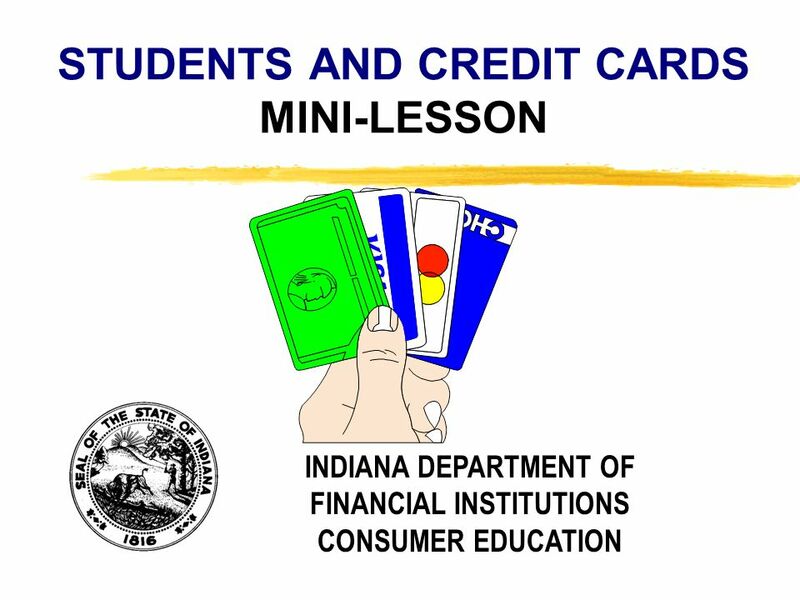 Download ppt "STUDENTS AND CREDIT CARDS MINI-LESSON"
Copyright, 1996 © Dale Carnegie & Associates, Inc. HOW TO CHOOSE A CREDIT CARD MINI-LESSON INDIANA DEPARTMENT OF FINANCIAL INSTITUTIONS CONSUMER EDUCATION. Credit Cards Avoiding the Credit Trap. Credit Cards Credit cards are a good way to build credit, if used wisely Receive monthly statements. Can be mailed. Key to the Future Chapter 2, Lesson 1 Warm-Up Questions CPS Questions Note for teacher: Use Pick a Student button in CPS. Credit. Lending Institutions Banks Mortgage Companies Finance Companies Credit Unions Insurance Companies Brokerage Companies U. S. Government Check Advance. Copyright, 1996 © Dale Carnegie & Associates, Inc. HOW TO FINANCE A USED CAR MINI-LESSON INDIANA DEPARTMENT OF FINANCIAL INSTITUTIONS CONSUMER EDUCATION. Understand business credit and risk management. © 2012 Cengage Learning. All Rights Reserved. 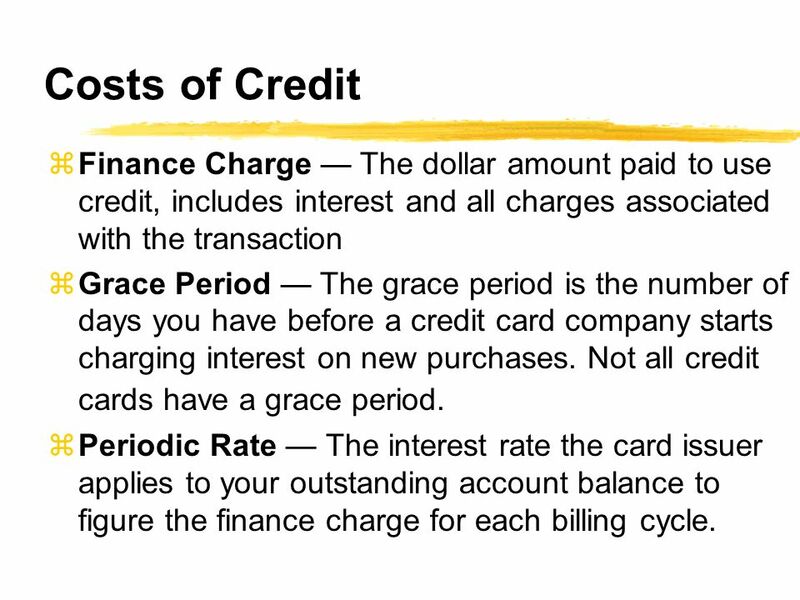 Principles of Business, 8e C H A P T E R 18 SLIDE Credit Fundamentals Cost of Credit.  Take a few minutes to look over your notes if you need to take/retake yesterday’s Quiz › Use the resources on Moodle to help you study › We will do a. Copyright, 1996 © Dale Carnegie & Associates, Inc. GETTING OUT OF DEBT MINI-LESSON INDIANA DEPARTMENT OF FINANCIAL INSTITUTIONS CONSUMER EDUCATION. 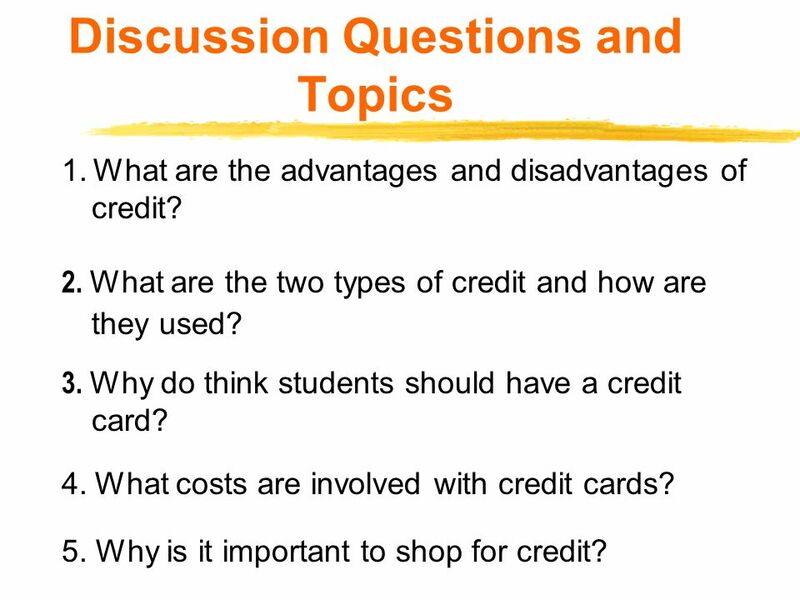 Teens 2 lesson seven understanding credit presentation slides 04/09. Back to Table of Contents pp Chapter 26 How to Get and Keep Credit. Credit You're in Charge What is Credit ??? 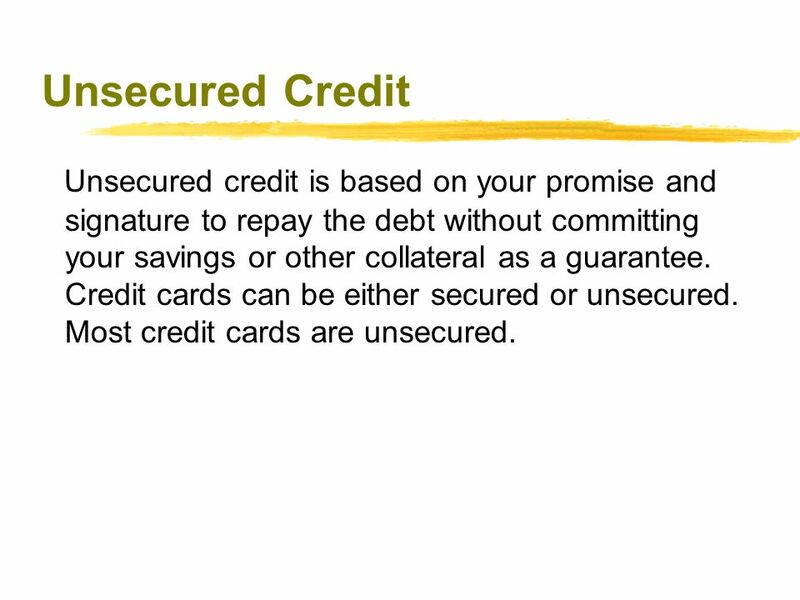 Credit is an arrangement to Receive cash, goods, or services now and pay for them in the future! Grade 12 Family Studies. B6I. USING CREDIT. Managing Money & Credit: A Lifelong Skill.